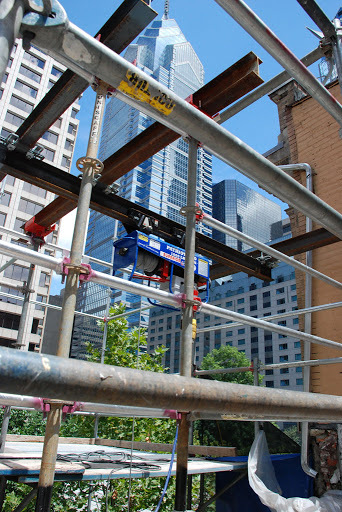 Jacob’s Ladder – Superior Scaffold’s material moving hoist system. Now, we all know that the biblical version of Jacob’s Ladder is the bridge between earth and heaven as dreamt by Jacob and described in the Book of Genesis. The significance of that ladder was obviously greater than our version of Jacobs Ladder. 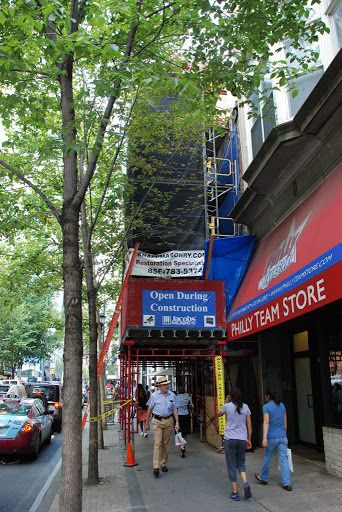 But our ladder, if you will, or hoist at Jacobs Music (in Center City, Philadelphia, PA) moves heavy material from the earth skyward to its position on the façade of this structure and even to the roof of the building. 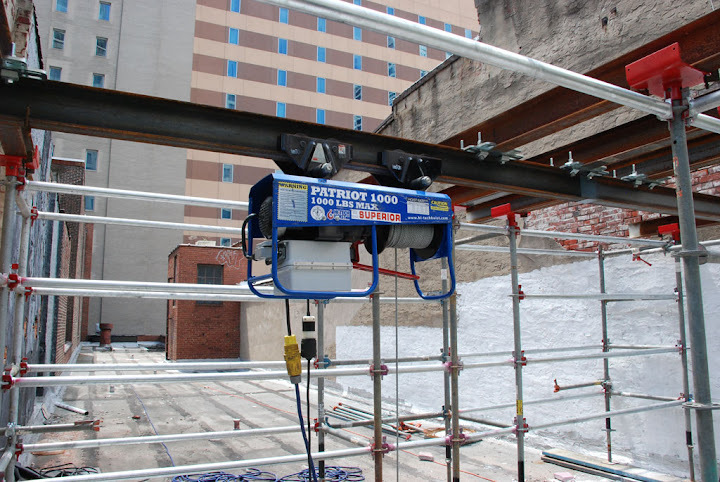 Using a Patriot 1000 material hoist rigged atop of system scaffold at the top of our canopy and on the roof, masonry crews from Knapp Masonry are able to position super heavy pieces of marble anywhere on the façade of the building. As you recall, Superior was sent out on an emergency call a while back when it was discovered that pieces of the façade were falling off. Our emergency services crew quickly erected an overhead protection system or canopy to protect customers and pedestrians. We also erected an access scaffold to get inspectors and crews up to see the damage so a plan could be developed for the repair work. 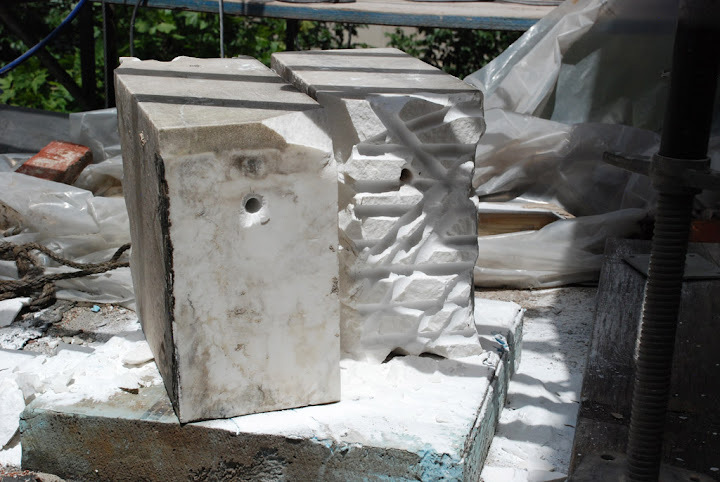 After that inspection, they determined not only were portions of the façade in disrepair but portions of the large marble panels needed to be replaced. And in order to do that Superior had to come up with another solution to get the material from the ground up to the façade. 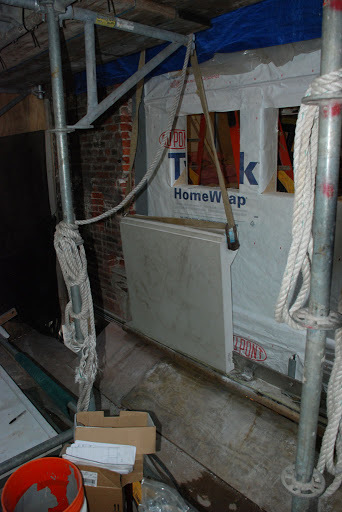 Originally, a material hoist was to be added to get the marble up from the ground in between the scaffold and building itself. 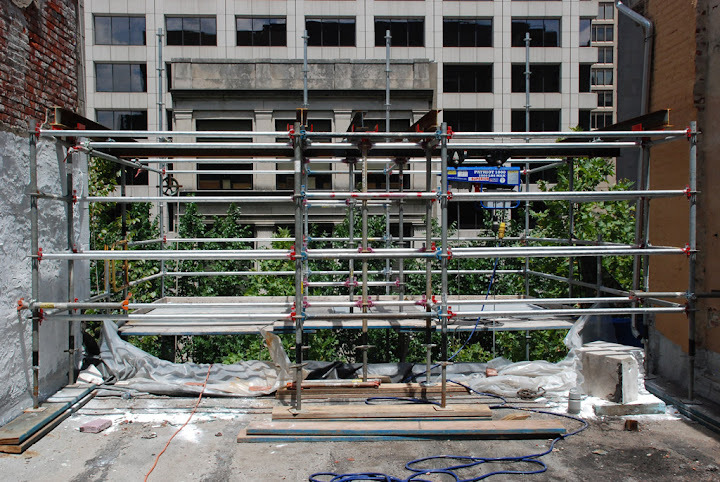 But our resident “King of Swing” Bob Sarkisian devised a monorail system to not only get the material up in between the building and the scaffold but to also get it anywhere on the façade and onto the roof where crews could work with it and store excess material. See the pics. 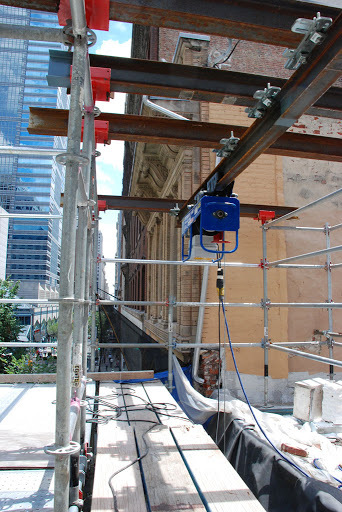 It’s really a brilliant idea using system scaffold, steel beams and a Patriot 1000 material hoist. 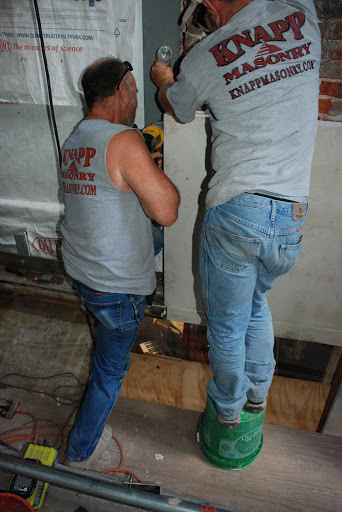 Here you can see crew members placing one of the heavy marble panels using the material hoist to get it into place. So not a ladder, per say, but a super intelligent way to move heavy material from the earth to the sky and even to a façade at Jacobs Music. And what post would be complete without some Rush for your listening pleasure. This entry was posted on Thursday, September 10th, 2015 at 7:25 am	and is filed under Canopy, Hoist, System. You can follow any responses to this entry through the RSS 2.0 feed. Both comments and pings are currently closed.